That was the point of yesterday’s real world lesson. In ground reference maneuvers you learn to fly a consistent shape over the ground – circles, s-turns across a road, rectangles – as practice for keeping the airplane on a consistent ground track when flying the traffic pattern. We actually tackled this earlier in my training, but we didn’t really spend a lot of time on it so we used yesterday’s consistent easterly winds as a reason for a brush up. Which is good, because the last time I did these I was not so good at them. The trick in these maneuvers is to vary your bank angle and heading in the air so you fly a consistent pattern over the ground. Think of it: if you fly in a circle with a steady wind from one direction, you will actually fly a spiral pattern as the wind blows you over the ground. So the key to flying a steady ground track is to bank steeply when you are with the wind and not as steeply when you are into it. 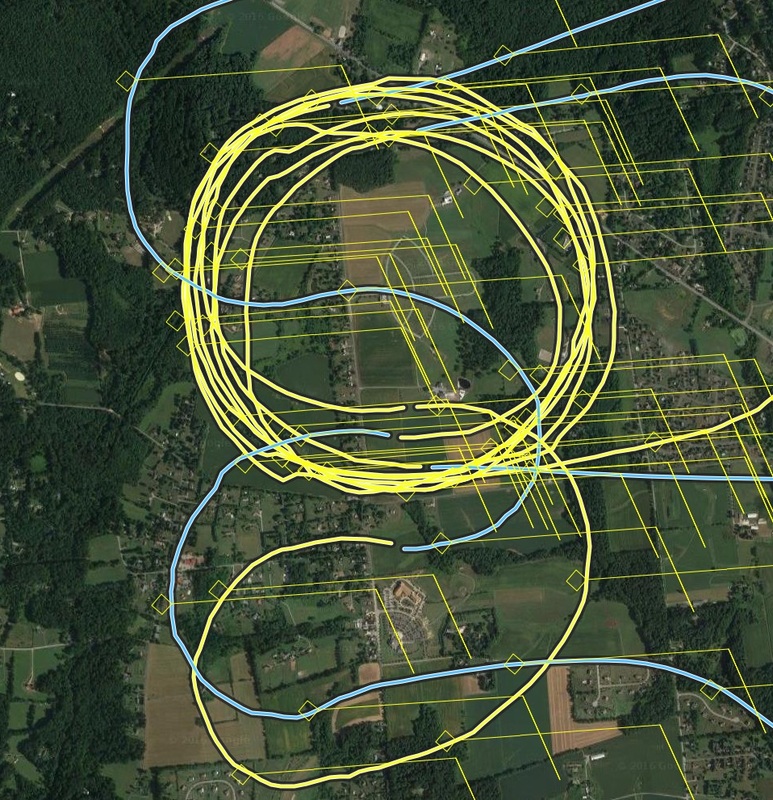 Here’s the track for part of yesterday’s flight, most of which was spent on a ground maneuver not surprisingly called “turns around a point.” There are a few “s-turns across a road” in there as well, as are the wind vectors (the thin yellow lines) which show the easterly wind. I did much better yesterday than a few months back. If you want to review the flight, follow this link. You can practice these in the sim, too. I did some of that in this video, and may shoot another as well.